It shouldn't make much difference, it is just another day, another week but somehow the start of a New Year is significant so should be the first post which celebrates it. This year, I agonised over the content, should I retrospect, there are some lovely food-bloggers' retrospectives out there, gorgeous pictures too. 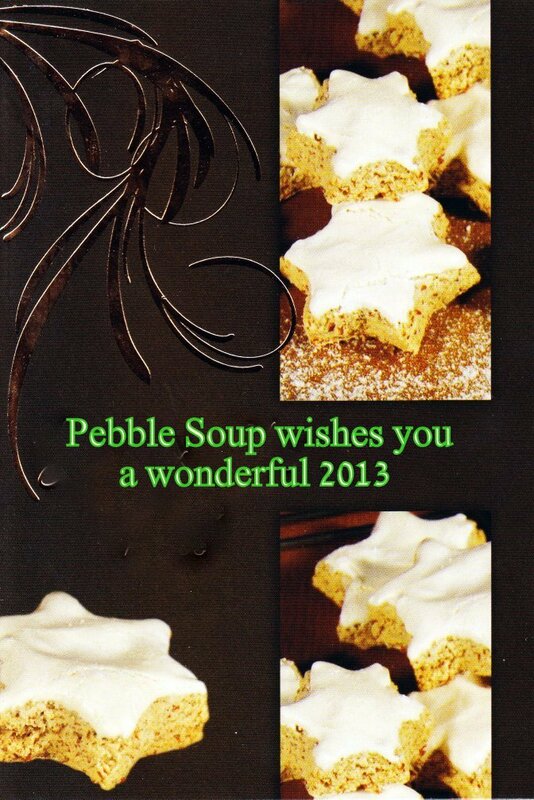 But not on Pebble Soup, not this year. This year I am looking forward. But first, I would also like to thank all the people who make my writing life enjoyable, least of all the readers. Over the past couple of years, I found my voice, it stammers at times, once in a while it confuses, mixes and shakes words but it is out and hopefully out there to stay. Sometimes, I use this voice to talk about issues which are important to all of us and what a better platform to do so than the first post of 2013. When I was a kid, I had two escape routes, one was books, the other was swimming. It didn't matter how bad things were if I could dive or read, then I was safe. From then on an interest for literature and a fondness for the sea and its inhabitant grew, neither went away. When the whales were in danger, in my opinion there was little I could do so I did nothing, but now that our common species are in danger, and I can do something about it. Over-fishing is a complex issue, many players and too much politic involved. But as often the solution to the problem starts on our doorsteps. There is little we can do about fisheries abusing the system, politicians dragging their feet and creating absurd laws which encourage fishermen to throw back in the sea perfectly edible fish, dead. However we can change our habits and reduce our consumption of species in danger, that includes cod, red mullet, swordfish, sea-bass, skip-jack tuna and many more. Of course, that doesn't refer to farmed fish which is not endangered. We can create a demand for sustainable fish such as hake, dab, gurnard, herring, mackerel, sardine, pollack, if we start with our consumption, the rest might take care of itself, after all it's 2013, it's a new year and it's full of hope for the future and that includes the future of the seas. Happy New Year to each Pebble Soup reader. I'll leave you with a recipe adapted from Mitch Tonks "Fish Easy"
In the meantime make a vinaigrette by mixing in a boil, mustard, vinegar until you get a thick mix add the rest of the oil and the parsley, mix and transfer to the pan.